A beautiful collection of stylish, environmentally friendly timber floors – in designer-selected colours, lightly distressed wire-brushed and hand-scraped oak wood floors. SuperSolid Hardwood has a 25-Year Wear Warranty and a Lifetime Structural Warranty for residential use. TORLYS SuperSolid Timber range, is a natural product. There is no water warranty with Torlys SuperSolid Ranges. Depending on the installation method, a solid timber floor can still be comfortable underfoot. The SuperSolid range has a stabalised ladder frame core, manufactured from the same timbers as the facing layers, top and bottom. This allows the entire board to expand and contract at the same rate and the ladder allows for movement and airflow within the board to reduce cupping. Depending on the type of underlay chosen and installation method, will determine the noise your floor will make when walked on and what will transfer into the room. With 100% hardwood core for stability and long-lasting performance, finished beautifully with Best-in-Class Klumpp top-coat. Like all solid timber floors, a thicker top timber layer has less resistance to denting. Spills and messes are easily wiped up with a cloth. To eliminate grime and grit, clean weekly by simply using a broom or vacuum (bristles down) and then when required use our Torlys Natural Glow Eco-friendly Cleaning Kit. Refer to Torlys Maintenance Guide for full details on keeping the appearance of your floor like new. Comfortable and beautiful for living rooms and bedrooms. Torlys SuperSolid range can be installed in all areas of your home, depending on your lifestyle. Like all natural timbers they do not have water warranties, therefore any spills must be wiped up immediately. The benefits of a Torlys pre-finished timber floor, is the controlled environment in which the top wear layer has been applied, making this harder with a UV cured KLUMPP® finish, therefore your floor can be installed and walked on in the same day, without jepordising the finished look. What you don’t see makes a difference. TORLYS patented E-Lock Hardwood core is innovative engineering that ensures superior performance for decades. E-Lock core and quality dry-sawn top layer, resists gaping, cracking and splitting – extra-durable for any climate. wear-resistant, superior gloss retaining finishes. A 5-Year Light Commercial and Lifetime Structural Warranty applies to light commercial applications. A Radiant Heat Warranty applies to all SuperSolid Hardwood. TORLYS is a member of the Canada Green Building Council, an association dedicated to the design and construction of green buildings in Canada. 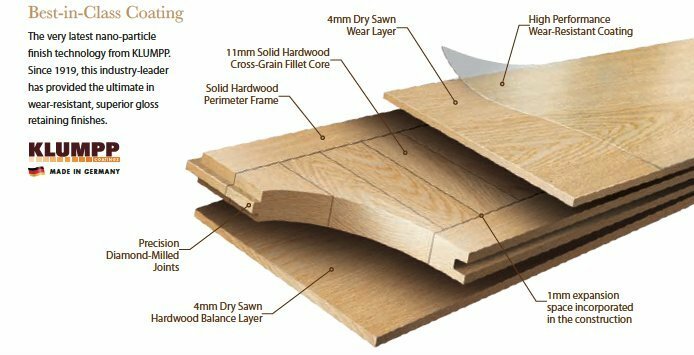 Built for Life in North America SuperSolid Hardwood out-performs solid wood across a much larger range of relative humidity, from 20-70% RH. As a general rule for comfortable living, it is recommended to maintain the RH in your home between 40 and 60%. A beautiful collection of stylish, environment-friendly floors – in designer-selected colours, lightly-distressed wirebrushed and handscraped oak. You’ve Never Seen Hardwood Like This. Long wide planks styled from White Oak, With 100% hardwood core for stability and long-lasting performance, finished beautifully with Best-in-Class Klumpp® top-coat. Beautifully styled hardwood in 152.4 mm widths and a contemporary colour palette - creating a floor that will stand the test of time in both looks and performance. "see this floor in my room"
You’ve Never Seen Hardwood Like This. Long wide planks styled in 5", 6" 7". With 100% hardwood core for stability and long-lasting performance, finished beautifully with Best-in-Class Klumpp® top-coat. Designer looks, Exquisite craftmanship available in a contemporary colour palette creating a floor that will stand the test of time in both looks and performance.